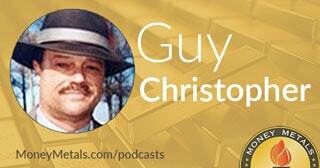 Coming up we’ll go down memory lane with Guy Christopher, one of our most popular columnists at MoneyMetals.com who recently passed away. Throughout his time with us here at Money Metals, Guy would often enlighten us as only he could, sharing his insights through his wonderful articles on our website, and we often had the privilege of discussing some of those stories with him here during our weekly podcasts. Today we’ll replay an interview he gave a couple of years ago where he set the record straight on what two very well-known but very misunderstood stories – Robin Hood and The Wizard of Oz – were really about -- and he explained how these classics have been distorted and turned into socialistic or an anti-sound money narratives. You will not want to miss today’s replay of this fascinating interview with the late Guy Christopher, coming up after this week’s market update. Precious metals markets faced selling pressure this week as bulls gave up some important technical ground to bears. Gold broke below the $1,300 level and currently trades at $1,291 an ounce, down 2.1% since last Friday’s close. Silver also sold off early in the week, threatening to trigger a major breakdown out of a two-year consolidation. But buyers quickly came in to push prices back up into the white metal’s recent trading range. Silver currently checks in 1.7% lower for the week at $16.47 an ounce. Platinum made a new price low for the year this week but did manage to hold above its 2017 low. Platinum now trades at $890 after this week’s 4.1% drop, while its sister metal palladium is off 2.4% to trade at $972 an ounce as of this Friday morning recording. For weeks, hedge funds and other speculators have been holding huge short positions in metals futures markets. The shorts were especially lopsided in silver. This is not normally the kind of positioning you see at the beginning of a major selloff. Bearish sentiment usually maxes out near the end of a major downside move. The fact that traders came into this week’s trading positioned heavily on the bearish side is one indicator that the selling pressure may already be close to exhausted. On a more fundamental basis, rising costs of production by precious metals miners should soon put a floor underneath prices. Rising energy and labor costs are making it more expensive to bring gold and silver out of the ground. In some cases, mines are producing at losses. At current prices, there is virtually no speculative premium on gold and silver, and that’s reflected in very low premiums across the board on most popular bullion products. Crude oil prices are holding firm this week at around $72 per barrel. Some prominent energy analysts are calling for oil to hit $80 per barrel this summer and possibly $100 by next year as the effects of U.S. sanctions and ongoing depletion of existing oil sources take their toll. The record supply glut of a couple years ago is no more. One way consumers and investors can hedge themselves against higher energy costs is by owning physical precious metals. They are, in a very real sense, a form of stored energy. Think of all the energy inputs required to move the earth… to separate relatively tiny quantities of precious metals from tons upon tons of rock and dirt… to refine the raw ore into pure gold, silver, platinum, or palladium. And finally, to mint the precious metal into beautiful bullion coins, rounds and bars. All that energy is represented in a tangible form you can hold in your hand. Silver in particular has practical applications in the production of energy. Silver is used in many types of batteries, including the ones that power smartphones and electric vehicles. Silver is also used in solar panels. Solar is the second fastest-growing energy source in the world and solar panel manufacturing is expected to consume at least 107 million ounces of silver in 2018. Although solar is far less efficient at generating power than fossil fuels, this “clean” energy source enjoys government subsidies and mandates. California recently mandated that starting in 2020 all new homes in the state must have solar panels installed on them – regardless of whether buyers want them or not, regardless of whether they make economic sense or not. The good news for those forced by the government to buy solar power systems is that solar energy has become more efficient in recent years. As prices for oil and natural gas rise, solar and other alternatives become relatively more cost effective. And the good news for precious metals investors is that more demand for solar panels means more demand for silver. Well now, without further delay, let’s get to my interview with the late Guy Christopher, who during his time with us here on earth lived quite a life. He was a member of the 101st Airborne during the Vietnam War and later worked as a stock broker, investigative journalist, and published author. All of this real-world experience combined with his communication skills has helped him provide our readers and customers with some really great insights over the years. Thousands of readers enjoyed and often commented on his writings at MoneyMetals.com. We hope you’ll enjoy one this conversation as we remember and pay tribute to a great American. Well I hope you enjoyed that the replay of that interview with Guy Christopher as much as I did. It was always a real joy to speak with Guy and he will truly be missed. And I’m pleased to announce today that Money Metals is naming an academic scholarship award and will do so every year in memory of our late friend. The Guy Christopher People’s Choice award will be given to the student whose essay on sound money is the most popular of all our entries each year – a fitting tribute to Guy Christopher, who connected with our readers and customers in a remarkable way.